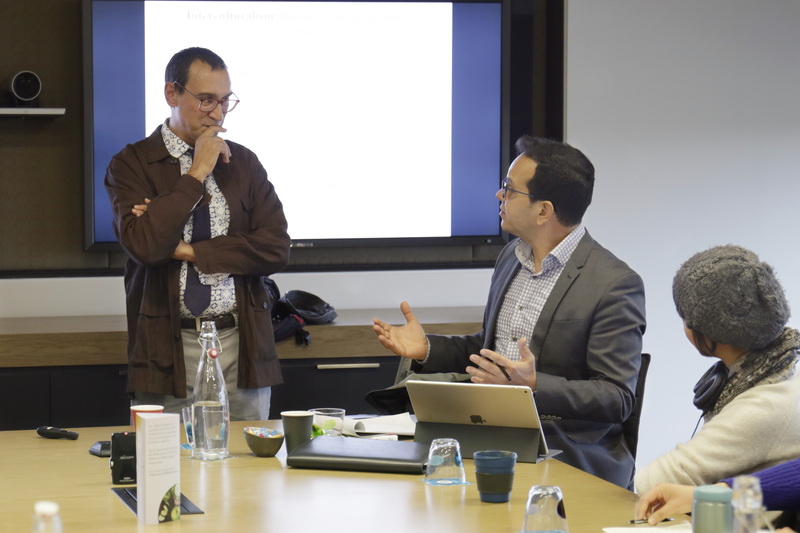 Professor Ricard Zapata-Barrero from the Department of Political and Social Sciences, Universitat Pompeu Fabra (Barcelona-Catalonia, Spain) was hosted by UNESCO Chair for Comparative Research in Cultural Diversity and Social Justice, Professor Fethi Mansouri at the Alfred Deakin Institute for Citizenship and Globalisation on 30 July 2018. Professor Zapata-Barrero’s main lines of research deal with contemporary issues of liberal democracy in contexts of diversity, especially the relationship between democracy, citizenship, human mobility and immigration. will formulate a defence of the emerging intercultural policy paradigm for the benefit of those who are still somewhat reluctant to accept its proper place within the current migration-related diversity policy debate. Firstly, the increasing intensity of the intercultural policy paradigm must be placed in the present-day post-multicultural period, which recognizes the strengths of the multicultural policy paradigm but also the limits to its process for recognizing differences. The role played by the emerging national civic policy paradigm (a renovated version of assimilation), prioritizing duties before rights, will also be considered crucial to better contextualize interculturalism. Secondly, I will try to identify the main distinctive features of interculturalism, which legitimize its proper place within the diversity debate today. Without rejecting rights-based and duties-based policy approaches, interculturalism places more emphasis on a contacts-based policy approach, aimed at fostering communication and relationships among people from different backgrounds, including national citizens. This approach focuses on common bonds rather than differences. It also views diversity as an advantage and a resource, and centres its policy goals on community cohesion and reframing a common public culture that places diversity within rather than outside the so-called Unity. The focus on citizenship will allow me to enter directly into dialogue with the main approaches proposed by the rights-based approach of multiculturalism (Kymlicka, Taylor, Parekh, Modood, etc.) and the duties-based approach of national-civism (Joppke, Brubaker, etc.). I am less interested in citizenship as an individually owned status to support claims to particular rights, but focus on citizenship as contact practices, much more akin to republican tradition. This will allow me to engage directly with the main theoretical frameworks that have dominated the diversity policy narrative these last decades, such as, for instance, the Unity/Diversity debate, the Majority\Minorities logic of founding citizenship arguments, always at the state level. In reviewing the current literature and the origins of the intercultural policy paradigm, I restate its contribution towards resolving current trends in transnationalism, changing identities, superdiversity and the rise of populist anti-immigrant parties. These are issues the old multicultural project has struggled to deal with, which has provoked the current disillusionment. Lastly, I will deal with some of the main criticism I have received by a variety of scholars, place my own perspective within the intercultural debate, and propose a research avenue to further consolidate interculturalism as a distinctive and legitimate policy approach.